Significantly, the two satellite datasets continued to show a steadily-lengthening Pause till last month, but over the past year or two, long before the present el Niño set in, the three terrestrial datasets had already succeeded in ingeniously airbrushing it away. How does reporting the global mean surface temperature constitute air-brushing? It's Christopher who wants to "airbrush" away the warming. He wants to ignore every single independent data set of global mean surface temperature, despite the fact, no because of the fact that they all show the same thing. He wants his readers to ignore the surface warming and look at the air up above. 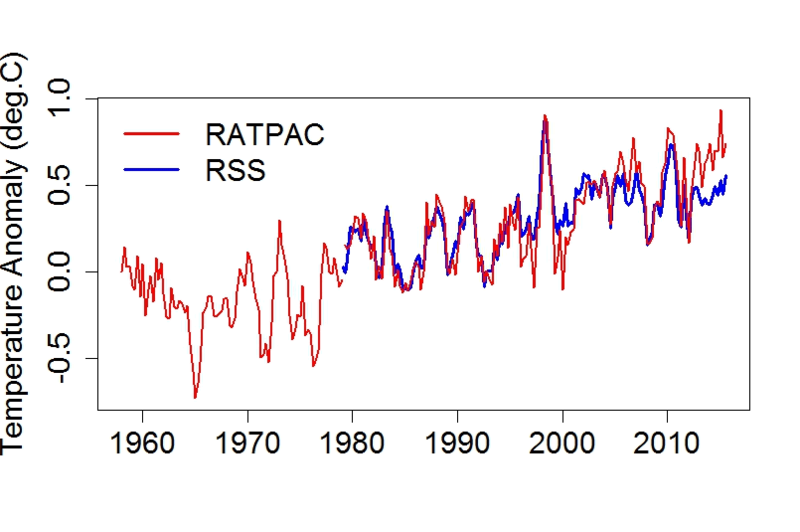 The not necessarily reliable Tom Karl of NOAA and the relentlessly campaigning Gavin Schmidt of NASA held a joint press conference to celebrate the grants their rent-seeking organizations can milk out of their assertion that 2015 was the warmest year since 1880. Nothing about the rent-seeking, grant-celebrating, sucking at the government teat of the denier duo Roy Spencer and John Christy, you'll notice. Then he complains that the scientists omitted trend lines, presumably referring to these slides they prepared. Christopher claims to have "added it back". As you can see, the odd ones out before the ERSST version update were NOAA and GISTemp. Now the data sets are more closely aligned. The only surprise is that deniers like Christopher Monckton didn't pick up on the lower NOAA trend and tout the NOAA data set as the perfect one. I suppose he didn't want to highlight the fact that the world has been warming. The trend line wasn't zero before any more than it is now. Now look at what Christopher Monckton drew, and how he tried to con his readers. I've added annotations to his original chart to highlight what he did. Figure 3 | Christopher Monckton's shonky trend line. The chart also shows the different trends over different periods as derived in Cahill15. Source: WUWT - with my annotations. What's more incredible is that no-one at WUWT seems to have noticed that the temperatures to the right of his chart have been above his trendline for the past 25 years! By using a linear trend through the entire period, Christopher Monckton has tried to "disappear" the warming since 1989. 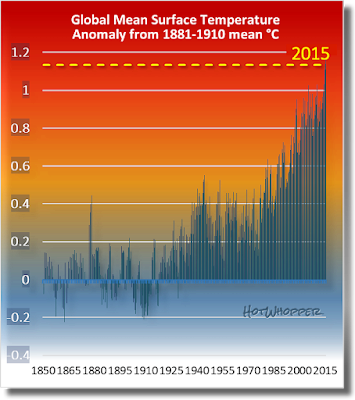 Has the satellite temperature record "gone more than somewhat agley"? So here’s the Houston problem, the 13th chime, the dog that didn’t bark in the night-time, the fly in the ointment, the poop in the puree, the jumbo in the Jacuzzi – the $64,000 question that would once have alerted true scientists to the possibility that somewhere their pet theory might have gone more than somewhat agley. ...Certainly, if not for a rich history of bungling, error, and accompanying arrogance, no one would ever have heard of Dr. Christy. But in these confusing times, for a science-challenged and ideologically blindered audience, Dr. Christy is science denial’s enthusiastic go-to guy, and a hero to intellectual titans like Ted Cruz, Rush Limbaugh, and Lamar Smith. When the first temperature-monitoring satellites began to deliver data, NASA said the satellite temperature record would be more reliable than the surface record because the coverage was more complete, the method of measurement standardized and the coverage and coverage-bias uncertainties that plague the terrestrial record were absent. He's wrong. It wasn't NASA who claimed that the satellite data would be more reliable, it was John Christy and Roy Spencer who claimed that. The very same people who are responsible for reporting satellite data. Think Dracula and blood banks, foxes and hen houses. This denier meme seems to have originated with "Steve Goddard", who plucked an article from the Canberra Times, dated ironically, 1 April 1990. The article said how "the report's authors said that their satellite analysis of the upper atmosphere is more accurate, and should be adopted as the standard way to monitor global temperature change." And who were the report's authors? None other than John Christy and Roy Spencer. This is the only press release from NASA that I could find, which could be related (archived here). It's about a paper John and Roy had published in Science in March 1990. Since then they've had to make lots of corrections. The first people to sound the warning were Gary and Kiehm, again in Science, back in January 1991, to which Roy and John replied. One of the problems all agreed was the contamination of troposphere temperatures with the cooling stratosphere. What happened in the intervening years? Christy and Spencer had to correct errors in their data, multiple times. And they are still making adjustments to their record. Look at how many changes they've made to the pristine, perfect record just recently. UAH is now on version 6 beta. Just in the past few months when NOAA had one update to ERSST (from v3b to v4), UAH has had five updates - from v6.01 beta to v6.05 beta. Why isn't Christopher jumping up and down asking how such a perfect reliable dataset could possible go through so many different iterations in such a short space of time? Why isn't he jumping up and down asking how there can be such a huge difference between version 5.6 and version 6 beta? Christopher is particularly interested in the period since 1997, so how does he explain the huge difference between UAH versions, his "more reliable" data, for the period from 1997? 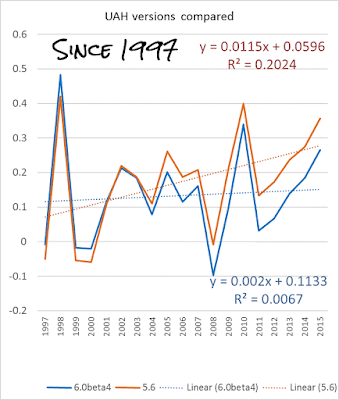 UAH has changed the trend since 1997 from 0.12C/decade to 0.02C/decade. How does Christopher Monckton explain how a "more reliable" data set can shift so much? He doesn't try. He doesn't even tell his readers that there's been a big change in the perfect UAH record. He doesn't. He doesn't even tell his readers that there is a discrepancy. Christopher says some other really dumb and wrong things. He suggests that the ocean is warming from below, not from above. He's wrong. The ocean is warming from above. It's warmed by the sun. Despite what Christopher seems to think, there are no leprechauns in the bottom of the ocean magically heating it up from below. The deep ocean is very cold, as shown in this image from NOAA. The laws of thermodynamics are not up for repeal. The official theory is that CO2 warms the atmosphere and the atmosphere warms the surface. But for almost 19 years the satellites show that the lower atmosphere has barely warmed. Even if there had been CO2-driven warming higher up, for the official theory says we should expect a faster warming rate in the mid-troposphere than at the surface, how could that higher-altitude warming have magically reached the surface through a lower troposphere that has not warmed at all? Is there something wrong with the estimates of mid-atmosphere temperature? 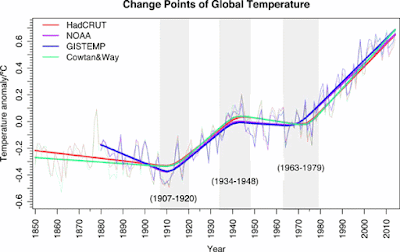 Is there something wrong with the record of the lower troposphere temperature? Or is it just that the atmosphere has been warming at a lower rate than the surface? Is Christopher Monckton going to ask Roy Spencer, John Christy and Carl Mears to redo their calculations? Is he going to ask them why the satellite record seems to be different to the records from radiosonde data? Is he going to ask them if the mid-troposphere temperature record also includes some of the cooling stratosphere? Christopher's also over-simplifying things when he writes: "CO2 warms the atmosphere and the atmosphere warms the surface". It's more complicated than that. As I expect you know, it's to do with how greenhouse gases absorb and emit longwave radiation. So the surface is getting hotter, the oceans are warming up and the air itself is getting warmer. The amount of energy coming into the system isn't balanced by the amount going out. There's more energy being retained, so Earth as a whole is getting hotter. 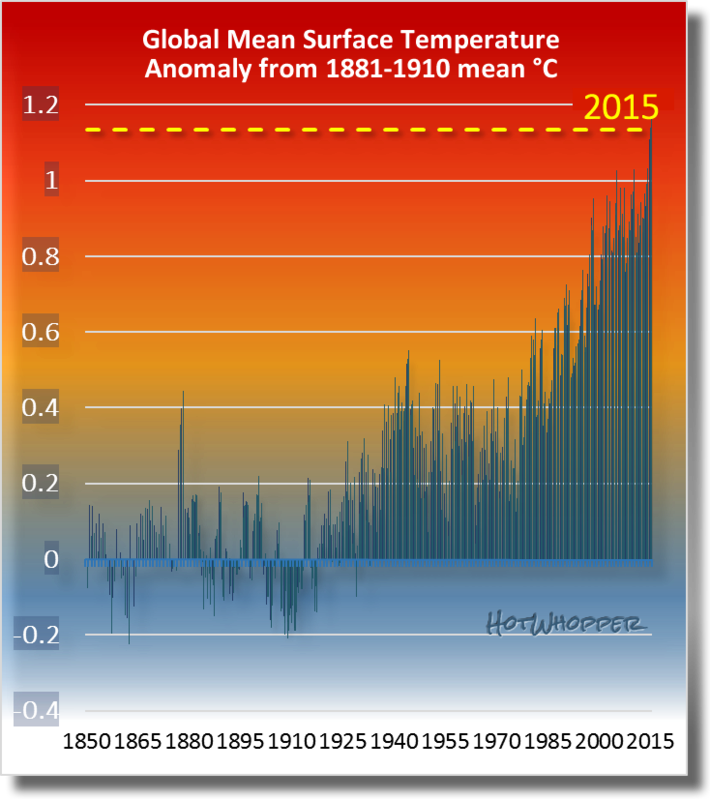 Where has the warming of the past 19 years come from? Well, as the scientists have been telling the general public for the past century and more, the warming has come from the increase in greenhouse gases. It's primarily come from the same source that John Tyndall showed back in the 1850's is responsible for the planet not being an ice block. From the same source that Albert K Varley said to the people of Mount Gambier, way back in 1884, would cause the planet to "become like a vast orchid house". It comes from an increase in greenhouse gases, primarily the waste CO2 that we're pumping into the air. How could Christopher Monckton not know that? This isn't 1885. He can't complain that he didn't get that edition of the Border Watch so he missed it. Scientists have been pointing this out since the early 1800s. That's more than 200 years ago. And it was proved by experiment in the 1850s. That's more than 150 years ago. How is it that Christopher Monckton has missed out on centuries of scientific knowledge? He's wrong. The heat shifts about in the system. Think ENSO events. Sometimes more of the extra heat goes into the ocean, and sometimes it goes to the surface or the air above. In 1990, at page xxiv of the First Assessment Report, IPCC predicted near-linear global warming of 1.0 [0.7, 1.5] K over the 36 years to 2025, a rate equivalent to 2.78 [1.94, 4.17] K/century. Under the IPCC Business-as-Usual (Scenario A) emissions of greenhouse gases, the average rate of increase of global mean temperature during the next century is estimated to be about 0 3 C per decade (with an uncertainty range of 0.2C to 0.5C) This will result in a likely increase in global mean temperature of about 1C above the present value (about 2C above that in the pre-industrial period) by 2025 and 3C above today's (about 4'C above pre-industrial) before the end of the next century. the report does not claim that "warming will be near linear"
there was a wide uncertainty range in the first IPCC assessment report. Because of long-period coupling between different components of the climate system, for example between ocean and atmosphere, the Earth’s climate would still vary without being perturbed by any external influence. This natural variability could act to add to, or subtract from, any human-made warming, on a century time scale. This would be less than changes expected from greenhouse gas increases. I could go on and on, because Christopher's article has errors from start to end. But enough's enough. Here are some reactions from Anthony Watts' dim deniers. How long will the pause of The Pause last? By the end of 2017 The Pause will likely resume and be 20 years old. By 2020 the pause will be the decline. Probably. The impact on ocean temperature from CO2 is not measurable and thus essentially zero. 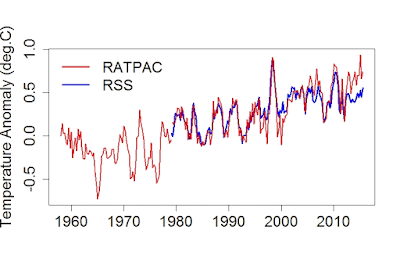 All efforts to erase the pause have now devolved to fiddling with ocean temperatures. Because physics shows CO2 cannot effect ocean temperature, this last ditch effort is the same as blaming a lack of unicorns for global warming. Truly, I am surprised that you would write that swill. Great and detailed report. Co2 has no impact whatever on climate, it falls out of climate. I guess most people failed grade 9 science – at least the warmtards who pray to the demon toxin named Co2. I wonder if any of these cult members understand convection, thermodynamics or that .00004 is a rounding error. Temps come and go – thanks to nature. And pollution ie human activity, is not climate. It’s interesting that Lord Monckton insists that we use the complete NOAA data set, back to 1880, when determining the trend in the NOAA data (third figure); yet finds 1998 to be sufficient for determining the trend in the RSS data. 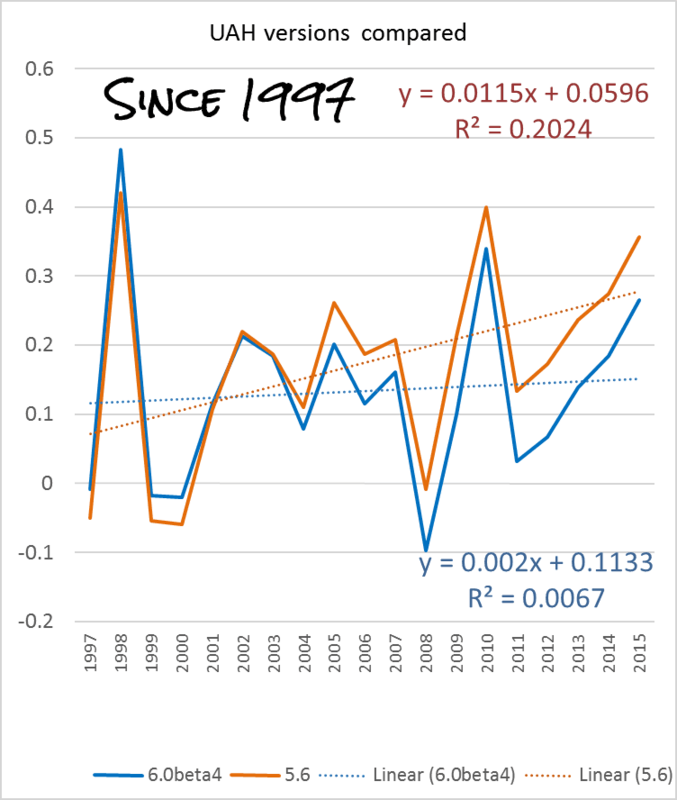 richardscourtney points out that NOAA would approve of using the complete data set, even though they wouldn't just draw a single linear trend line from one end to the other. He still seems to think it's okay for Christopher to hide part of the RSS data. the graph provided by Karl and Schmidt is for 1880 until now and Karl, and Schmidt would rightly be offended if it were truncated to the period of the misnamed Pause as indicated by the RSS data. Lord Monckton nails down the fact’s as usual, thank God we have such a brilliant man on the side of science and truth. Can you tell me something? Why are Spencer & Christy the only ones with access to this data? It's clearly of great importance so why isn't anyone else working out how best to analyse & interpret it? The data is feely available from NASA. We just don't know how it is analysed by Christy as he refuses to release his code. I guess I meant why isn't anyone else doing the analysis if theirs is suspect? Surely there is someone else somewhere in the world who could do it? I don't think that really answers my question. The answer is RSS was set up partly as a second opinion on the satellite data after all the errors in UAH. There is also the STAR project, from NOAA who actually built many of the satellites. But they don't attempt to calculate the lower troposphere temperatures, which might be an indication of how difficult and error prone the calculation is. The fact that this data is talked about so much is cherry picking on behalf of Monckton and others. It disagrees with models and they exploit that uncertainty to spread doubt about other data sources. But they provide no physical explanation or alternative interpretation except the insinuation that 'therefore all conclusions based on CO2 theory are wrong'. Sou I have been hanging out all day for your response. Fantastic! I haven't been bothering with Christopher's articles much lately. His Gish gallops are too long with too many wrongs, so to address every point makes articles TLDR. This one is borderline long. His tactics are the same as young earth creationists who want to tear down 140 years of biology. Climate science goes back further than that, which makes his persistent denial all the more silly. Why anyone would tolerate a con man like Christopher is perplexing. Of course his host, Anthony Watts, is also a con man who has pretty well cornered the market for wacky climate conspiracies. I could not believe that he threw the lever to Russian Steam Pipes but then I realised his childish argument left him no option other than to say the observed warming came from below. He's fatally wedged himself . Even Anthony is not that stupid. Sou, your articles are entertaining, fascinating, and informative. Not one can be subject to TLDR. In fact, when I finish one I always lament it was too short. And thank you for including my Daily Kos article in the "further reading". I'm honored. Monckton's article seemed longer and even more shrill than usual, bang-up job wading through it and hitting the low points. Desperation is a stinky cologne. ... they'd throw that crap right out the window. Yes, as you've shown, there's not a lot of difference between ERSSTv3b and version 4 as far as I can tell. That's why most deniers don't post charts. Except for Bob Tisdale, and when he does you have to ask why he's making a fuss about such a relatively small difference. To find reliable graphs on Google images you pretty much have to type in -tisdale... or be prepared to scroll forever. He's made a huge difference there. RSS is the only data series left for which Monckton can do his unscientific maths act. Soon that will be gone too. "Theory? More like a fairy tale. So “Green House Gas radiative forcing” warms the planet? I want my teachers all rounded up and punished for telling me it is the big ball of fire in the sky that warms the planet. (if they still live after all these decades)"
If it is is just "the big ball of fire in the sky", how would markstoval explain that that Venus is hotter than Mercury, even though Mercury is much closer to the Sun? They then hit you with "internal heat". Or, because the surface pressure is ~90bar. Because of course, we can suspend empirical physics. It's never occurred to them that their bike/car tyres don't stay permanently hot after they've been pumped up. It's always down the rabbit-hole with those types and I prefer to retain my sanity by not engaging. So the best they can do today is to claim they are destroying the planet on a slightly longer timescale. Amazing. Looking at that chart, it appeared that the difference was most pronounced in the north polar sub-series. I then calculated the difference between the UAH TLS and the RSS TLS using the respective polar series. What I found is summarized in THIS PDF file. The first graph is a plot of the difference and trends divided at August 1998, which was the first AMSU data used by UAH. There appeared to be an annual difference seen as a string of high readings. I then collected each year's monthly data in a spread sheet and averaged the result for each month, the results are shown in the second chart. It turns out that all those high values were for April, while the lower temperature ranges are for November, December and January. The monthly plots on the second page show some additional features, such as several data points which appear to be outliers. These data are all calculated from the same time series of available MSU/AMSU data, any differences are the result of the processing from each group. I intend to take a deeper look at both the UAH and RSS data to find the source of these differences. Good work. I got as far as figuring that it's the northern hemisphere that's the problem (with UAH at least). That's where it differs most from surface temps. Your analysis is fine tuning things a lot more. Given the satellites coverage is limited to 82.5 degrees north/south, how much is the satellite-derived component of the polar temperatures? Or are they interpolated manually? Sou, HERE's Some More fun with a spreadsheet. In this PDF, I show the results of applying two different filters to both the USH and RSS versions of the TLS Polar data. I used 7 point and 25 point filters, then subtracted the time series from the 25 point filter from that produced by the 7 point filter. I did this for the both UAH and RSS, then subtracted the RSS result from the UAH result, which is shown in the first graph. As one can see, there's an obvious yearly cycle in the data, which I guess might be the result of differences in the basis used to calculate the yearly average which is used to calculate the anomaly series. The second graph shows an expanded section from the first, focusing on the negative spike around January 1990. The third graph is the difference between the 25 point graphs, which shows the reason for the larger cooling trend reported for the original UAH series. The graphs on the second page are monthly data extracted from the series shown in the first graph. Sou, Having built the spread sheets, I repeated the filtering test using TMT data in place of the TLS. HERE are the results (PDF warning). There's an even more interesting annual cycle in the TMT, as one can see from the first graph. Looks seriously distorted to me. And again, we see the peak of the cycle around April. Are we being taken for April Fools??? Eric - I assume these are all anomalies? There's a clear difference between trends in Fall/Winter vs Spring/Summer. It's difficult to tease out monthly differences since they mostly have different vertical scales. I might be interesting to replot them on a one year horizontal scale with each year a separate data series. Kevin, My plots are derived from the respective anomaly data. HERE's the link to the UAH data and HERE's a link to the RSS page from which the series may be both plotted and downloaded. I used the UAH v6beta4 series and they have just posted their "beta5" version, so you might compare the two different sets, as UAH gives both versions. I;m not sure if this was wise, but I've asked Monckton on wuwt if there's any difference between how he calculates the pause, and what he called the "statistical lie" of the endpoint fallacy, of choosing your start point to get any trend you like. It's odd the more I've looked through the archives, how just about everything wrong with Monckton's pause, are things that he's vigorously complained about when done by others (or when he thinks it's been done). Well that seemed to rattle some cages. Aparently the answer is that it's not cherry picking if you calculate the end point, rather than selecting it manually. I think the reaction at WUWT reveals an even deeper disunderstanding. The commenters there have, I think, been misled by Monckton's very careful choice of words. Monckton appears to say -- but does not quite come out and actually say -- that choosing a starting point at any time after The Onset Of The Pause will yield a zero trendline. Monckton does not quite say (but his fans BELIEVE he says) that all the start points from June 1997 up to today will give you a zero trend. Monckton does not quite say (but his fans BELIEVE he says) that, going backward in time, June of 1997 is earliest month in which this is true. I'm not sure I'm stressing and explaining this point properly. The WUWTers really believe nothing has changed in the climate since June of 1997. They really believe any trendline beginning at any random month in the last eighteen years will give you a flat trend. Thanks D.C.Petterson. I suspect you might be right about some thinking that the trend will be the same whatever date is picked. I also suspect that some are confusing Monckton's definition of the pause with others that define it in terms of a lack of statistically significant warming. Bellman, that's probably so. I bet the concept of "statistical significance" is beyond most of them. It appears to be beyond Monckton (or at least, beyond what he thinks his intended audience can understand) or he'd be able to continue claiming there is a "statistically significant" pause underway, and he wouldn't have to keep changing his start date to make that claim. The problem, of course, is that once you bring "statistical significance" into play, the "pause" itself becomes nothing more than mathturbation. I think the simple truth is he is preaching to an audience that believes drawing straight lines on “graphs” represents “science”. Presumably at least some of the more clued up members know that it’s a simple fraud – but accept it because is supports the overall denier narrative. I always find it fascinating to read the stories of people who have actually found their way out of the “rabbit hole”, it often starts by relatively small light bulb moments; when they realise how this simple “straight line” fraud has deceived them. Wow, really? So, the notion is that deliberately choosing the present because it generates the results you want is somehow not a cherrypick, i.e somehow not a clear example of selection bias? The assumptions behind regression always, always, always refer to the distributions of randomly chosen points. The error here is much the same error of bias that students make in the famous Stats 1 class example where the teacher asks half the class to perform 100 coin flips and record them and the other half to create list of 100 simulated "random" coin flips and then leaves the room. It is trivial to come back into the room and sort the students' sheets into those which actually flipped coins with very high accuracy. Why? Because students generating rather than producing "random" numbers unconsciously suppress runs as "they don't happen randomly". Fact is runs do. With calculable regularity. With positive autocorrelation--which naturally occurs in climate data--the effect is further magnified making "pauses" even more likely than would be expected under the usual white noise model deniers assume here. Anyone examining the whole of any climate temperature series will note "pauses" are common. Yet somehow this fact is ignored and only the present "pause" is inferred to be something real...as opposed to being something totally expectable statistically. And if this upsets Monckton . . . I was going to ask if you feared his Lordship's pinstriped solicitors from the venerable firm of Dewey, Sougham & Howe LLP. Ravenous silent grey ghosts, few enemies of the Viscount have detected these phantom ninja legal warriors before it was too late. But no worries... you're clearly prepared. I have had private “conversations” with Monckton where he has used the excuse for not suing me as “American laws”. Also, if you file a U. S. lawsuit, you have to prove that anything said about you is not true. If you check my webpage, you will see that I’ve got everything backed up with documentation. The way any calculation of any trend should be done is to fix the start point PERMANENTLY and go forwards.. The way Monckton does it is the exact reverse. And it is disingenuous to say the data “chooses” the end-points, and is therefore not cherry-picking …. because you start at a moving endpoint (present) – which is really the start – and end it when the data no longer agrees with the trend you want. BOTH ends are moving and not just the chronological end. If you also use a feasibly unphysical “spike” in the GMT data (which is what the Sat sensing of the 97/98 Nino is) – you could run for quite some time with an equally unfeasible zero “trend”. I would venture to suggest that if the “spike” were an equally unfeasible dip in GMT it would be ruled obvious. BTW: If you say the trend following that Nino (blue) is robust and reliable then you should also accept that the trend before it (red) was likewise. Yes? Actually it wont be until ~2025 even if the “pause” remains. The “pause” therefore is logically a STEP-UP in GMT that has still not leveled-off long enough to fall back to the original trend. It is of course NOT. just as it is neither a “pause”. The only reasonable trend that can be taken from the series is the purple one." Thanks Tony. Though I don't entirely agree that the only way to calculate the trend is to fix a permanent start date. As far as I understand it, there I several ways a statistically meaningful start point can be calculated, but none of them are likely to give the result Monckton wants. I'd really like to go through all the problems with this Great Pause, but given how much time I've wasted defending one simple point, I'm not sure if it's worth it. Monckton is even more dishonest about the IPCC projections than you point out .... That 1990 report had 4 Scenarios, A through D, they labelled A as 'BAU' as it was an extrapolation of forcings with no curbs on emissions, and some assumptions about economic activity. A gave the highest warming rate, B & C gave a lower rate. In fact forcings evolved far nearer to B&C than to A, so these should be used - but Monckton has airbrushed them out of history. He justifies this by citing the emissions from a single year as being below Scenario A, as if that were relevant - the forcing comes from cumulative concentrations of the GHGs. "I had not recalled that IPCC had made its 1 k by 2025 prediction under Scenario A. However, Scenario A was its business-as-usual scenario, and it had incorrectly predicted a far greater rate of forcing, and hence of temperature change, than actually occurred." Repeated at WUWT, but apparently censored by the site that does not censor. Partly because Lord Monckton is using a forcing scenario that did not transpire. As the IPPC did not know how climate forcings would develop the 1990 report published 4 projections under 4 scenarios. They labelled them A-D, and selected A as their 'BAU' case, meaning no controls on emissions and certain assumptions about economic growth. With hindsight we can now look back and see which of the scenarios came to pass, and no it was not A. Forcings actually developed nearer to scenarios B & C, A turned out to be an overestimate. For a fair assessment we should examine what IPCC forecast under Scenarios B & C, but as they were pretty close to the actual temperature change, they have been silently airbrushed away by His Lordship. But don't take my word for it … "However, Scenario A was its business-as-usual scenario, and it had incorrectly predicted a far greater rate of forcing, and hence of temperature change, than actually occurred"
Perhaps you might like to add your own logs / screenshots to the growing collection? Speaking of denialist nut jobs, the ABC has just announced that Mark Steyne is a panelist on next week's QandA - and he was hailed as a "conservative beacon of light". I vomited a little bit in my mouth. Does the IPA still own the ABC? ONe really does wonder these days. I expect that Steyne will be heavily involved in justifying Larry Marshall's (and thus the LNP government's...) decision to eviscerate climatology and oceanography in Australia's mandated national science organisation. There will inevitably be glib spin doctoring both of the fact of global warming, and of the magnitude and cause, and of the nature of the necessary responses to it. I hope that there is a serious amount of pushback by professionals in the field, and that some might even make it to being in the audience given that someone like Steyne was put on the panel along with rabid denialist Barnaby Joyce, and without the benefit of an informed countering voice. Yes, Sarah Hansen-Young's there, but I doubt that sh'll have the intricate understanding and scientific gravitas to effectively refute the nonsense that Steyne and Joyce will spout, and the government and industry Denialati will be looking for an effective slap against the science in their pogrom to take as much scientific reason out of the debate as they can. These are truly extraordinary days in Australian science, and I'm agog that the mainstream has not understood the magnitude of the changes that the government and their man Marshall are visiting upon the nation's capacity to participate in world-class research of the most serious problem that humanity faces. I think I just chucked on my lap. I will have to watch that one. I hope he stays away from climate change. And if the ABC has any sense they will keep him away from Islamophobia as well. Mark Steyn is described as a "and a leading Canadian human rights activist". I think the only rights he is interested in are to be allowed to say whatever he likes about whom he likes, regardless of the truth. He is still banging on about the ClimateGate fabricated scandal. Another point I'm not sure has been mentioned. "I am not the only one to sense that Dr Mears, the keeper of the RSS satellite dataset, who labels all who ask questions about the Party Line as “denialists” and in early 2016 took shameful part in a gravely prejudiced video about global temperature change, may be about to revise his dataset sharply to ensure that the remarkable absence of predicted warming that it demonstrates is sent down the memory hole." "Considering how unconcerned Monckton is about the recent changes made to UAH, it's interesting he's already complaining about the possibility of RSS data being revised"
He's getting his retaliation in first, and no one can complain about UAH because it is run by the saintly duo of Spencer and Christy, whom God preserve, who have never done a thing wrong in their entire lives (snigger).